From the basics to the bountiful little souvenirs that celebrate New Bern, Bynum's Drug Store is a prime downtown shopping destination for all the essentials and then some. Modestly sized but stocked with everything a visitor or local resident could want, this independently owned and operated pharmacy has a lot more than meets the eye, and is certainly worth a peek for anyone exploring the New Bern area. Bynum's Drug Store is located along Middle Street in the heart of the downtown region’s shopping scene, and the historic brick building feels like a blast from the past, both inside and out, thanks to the down home atmosphere and customer service that is brimming with southern hospitality. 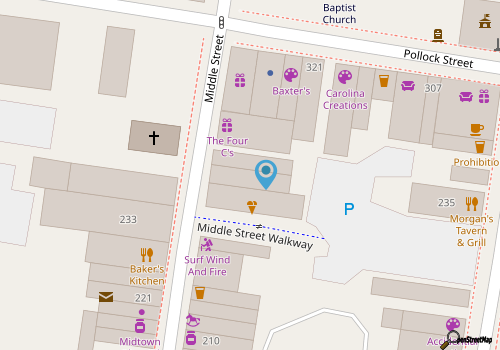 Prescriptions can be filled at the shop, (and deliveries are also available), but everyday visitors will want to explore in order to stock up on bath and beauty products, sunglasses and sunscreen, candy and snacks, seasonal merchandise, and a selection of budget-friendly New Bern souvenirs. With a fun local atmosphere, and plenty of items that include the basics and beyond, Bynum's Drug Store is a cool little stop along any downtown exploration where visitors can pick up all the essentials they’ll need during their stay, and much more. Call 252-637-3123 for current hours.